Traditionally in Catholic circles, the month of June is dedicated to the Sacred Heart of Jesus. It seemed in my mind a calculated gesture to release the film For Greater Glory on June 1st. The film tells of the Cristero War of Mexico (1926-1929), and the Mexican people’s fight for religious freedom in an anti-clerical climate. For Greater Glory struggles to explain the history of the conflict leading up to the Cristero War (how much of history can be told in a two-hour film? ); how the loss of religious freedom was not done in one sweep with the ratification of the Calles Law of 1926. No, the Calles Law was only the last straw in a long, drawn-out oppression of the Church clerics written into the Mexican Constitution of 1917. The people’s rebellion began peacefully, with non-violent protests and boycotts, and only escalated as the Mexican government under President Calles began to persecute clerics and the faithful more openly. The people rose up to fight for their religious liberty under the banner of Christ the King (Viva Cristo Rey – Long Live Christ the King). But much before the Cristero War began, the people have been sharpened like swords fashioned in the hot flames by the oppression they have experienced. Today, here in the United States, where we enjoy and exercise our freedom to practice our faith openly is being challenged under the current President and his administration. You might be thinking, “Oh, Sister Lisa Marie, what we are experiencing is nothing on the scale of what happened in Mexico.” And, thankfully, your statement would be true. If we keep an attitude that what happened in Mexico can never happen here in the land of the free and the home of the brave, and continue to enjoy our freedoms and do nothing to preserve them, we will one day find our Catholic institutions – hospitals, schools and other charitable organizations – closing their doors. This will happen due to the regulations being put in place by means of the Health and Human Services mandate, which defines a religious institution in such narrow terms that Mother Teresa and her Sisters would not even be defined as a religious organization in their works of charity. And this, I fear, would only be the beginning. Who will lose? First will be those who depend on these services. It is happening already with universities, in planning the new school year they are dropping their healthcare plans because of the mandate and the rising costs involved in meeting mandate criteria. Who will be next? Those who benefit from Catholic Social Services – and other resources like it – will be the next hit. Catholic Social Services (go ahead and google it; they are found in almost all diocese in the United States, like this one in Sacramento, CA) employs not only Catholics, but people of other faiths too. Because of this, by definition of the HHS Healthcare Mandate, this large network of services for those in need would not qualify for religious exemption by the federal government (because they employ – and serve – people of other faiths). Strange isn’t it? The very quality that demonstrates her Christian principles works against the Church under the Obama administration. participate in a Fortnight for Religious Freedom. Check with your diocese to see if it has other things planned. The Diocese of Sacramento will sponsor a Walk for Religious Freedom on the eve of Corpus Christi, a Eucharistic procession through the streets of Sacramento. Pray for a positive outcome to the Fortnight for Religious Freedom activities taking place in dioceses across the country. Gerard Nadal is posting a Novena for the Fortnight on his blog for the next nine days to help in this preparation. Please consider praying it. Pray for the outcome of the court case between Catholic Charities of Sacramento v. Superior Court of the State of California. And please continue to pray for our Bishops. We are called to walk with Christ. What better time to devote to this good work than in the month of June, dedicated to His Most Holy and Sacred Heart. 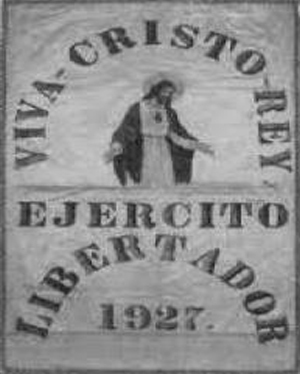 In the picture above of the banner used during the Cristero War, it has a picture of the Sacred Heart of Jesus with the words, “Viva Cristo Rey!” Christ is our King, who from the Cross, paved our way to freedom from sin. Let us pray that we will be able to continue to openly worship and serve Him. Was Mother Teresa’s Work “Catholic”? Who are the ‘Josès’ in Our Lives? Thank YOU very much for your blessing. YOUR information works for my head. I pray for our Bishops. I do believe that what happened in Mexico can happen here in US, perhaps will take time but if laws are implemented that go against the true teachings of the Catholic Church people who stand by these teachings could face trial and imprisonment if they go against such laws; some laws are evil and are being written under the guise of “the common good”. It is kind of disturbing because the father of lies always tempts people using something that people perceives as “good”.